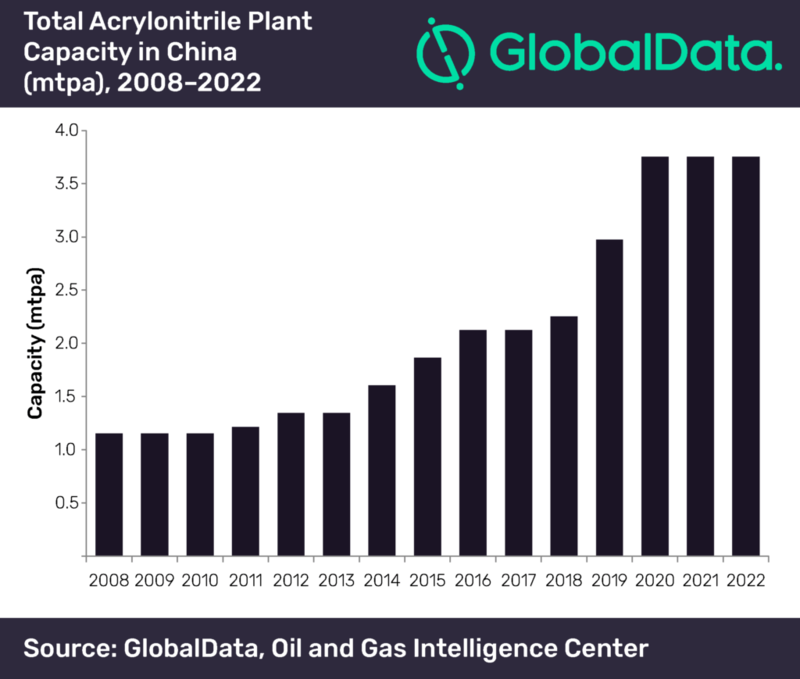 China’s Acrylonitrile plant capacity is forecasted to grow at a compound annual growth rate (CAGR) of 12.1% from 2.124 million tonnes per annum (mtpa) in 2017 to 3.754 mtpa in 2022, according to GlobalData, a leading data and analytics company. The company’s report: ‘Acrylonitrile Industry Outlook in China to 2022 – Market Size, Company Share, Price Trends, Capacity Forecasts of All Active and Planned Plants’ reveals that six upcoming projects, CNOOC Refinery Dongfang Acrylonitrile Plant, Guangdong Peng Zun Energy Development Donghai Island Acrylonitrile Plant, Shandong Haili Chemical Industry Zibo Acrylonitrile Plant, ShengHong Holding Group Lianyungang Acrylonitrile Plant, Sinochem Quanzhou Petrochemical Quanzhou Acrylonitrile Plant and Zhejiang Petrochemical Daishan Acrylonitrile Plant are expected to commence their production by 2022. The largest Acrylonitrile plants in China in 2017 were Jilin Petrochemical Company Jilin Acrylonitrile Plant, China Wanda Group Dongying Acrylonitrile Plant, Jiangsu Sailboat Petrochemical Lianyungang Acrylonitrile Plant, Shanghai SECCO Petrochemical Company Caojing Acrylonitrile Plant 1 and Shanghai SECCO Petrochemical Company Caojing Acrylonitrile Plant 2. China National Petroleum Corp, China Petrochemical Corp, BP Plc, China Wanda Group and Jiangsu Shenghong Group Co Ltd together accounted for 93% of the Acrylonitrile capacity in China in 2017. The main sectors that consume Acrylonitrile in China are Acrylonitrile-Butadiene-Styrene (ABS), Polyacrylonitrile, Nitrile Elastomer and Acrylamide. In 2017, these sectors accounted for almost 97.9% of the Acrylonitrile demand in the country. The average price of Acrylonitrile in China is expected to increase at a CAGR of 3.3% from $1408.6/tonnes in 2017 to $1655.8/tonnes in 2022. Between 2008 and 2017, China had been a net importer of Acrylonitrile. According to GlobalData, it is expected to continue on similar trend with imports being higher than exports until 2022. Imports as percentage of demand in 2008 was 23.4%. GlobalData forecasts imports as percentage of demand to decrease from 13.5% in 2017 to 5.8% in 2022.